August 30, 2018 -- Treatment planning for particle therapy is currently performed using x-ray CT images of the patient with the CT Hounsfield units (HU) converted into relative stopping power (RSP). This conversion process leads to uncertainties, however, and an error margin of around 3% is generally employed to mitigate any potential errors. A better option may be to use protons or other ion beams to create patient images for particle therapy planning. At the recent American Association of Physicists in Medicine (AAPM) annual meeting, Sebastian Meyer discussed the potential benefits of ion-beam CT, which he is investigating in the framework of his doctoral research at LMU Munich, in collaboration with the LMU University Hospital, Yale School of Medicine, and Heidelberg Ion Beam Therapy Centre. "Ion CT provides a direct estimation of relative stopping power and eliminates conversion uncertainties," he told the delegates. "It can also eliminate metal artifacts." Simulated proton-CT, helium-CT, and carbon-CT images. Image courtesy of Sebastian Meyer. Meyer presented results from FLUKA Monte Carlo simulations comparing proton, helium-ion, and carbon-ion CT for proton therapy planning. He described the simulation of ion-CT images at 2 mGy physical dose using an ideal single-particle tracking detector for two head-and-neck cases treated with scanned proton pencil beams. After reconstructing the images, Meyer and colleagues imported them into the RayStation treatment planning software. Proton therapy plans were then optimized on the reference anatomy and recalculated on the various ion-CT scans. 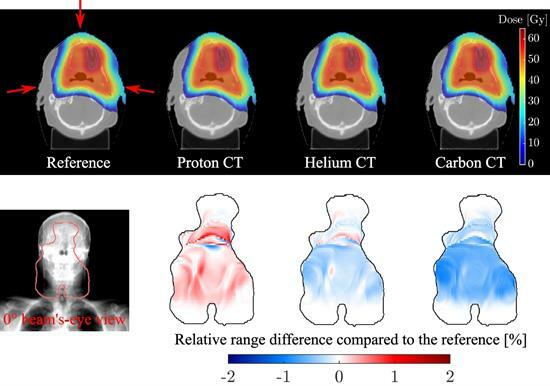 The reconstructed proton-CT, helium-CT, and carbon-CT images were similar in appearance although helium-CT and carbon-CT were slightly noisier, and all displayed comparable dose calculation performance. The researchers quantified image quality by calculating the RSP relative error. Meyer noted for heterogeneous image slices, proton CT exhibited the highest error, but this reduced for more homogeneous slices. The average RSP relative errors over all image slices were 1.4%, 1.1%, and 1.4%, for proton CT, helium CT, and carbon CT, respectively. Looking at the range differences, helium CT and carbon CT generally underestimated the range, while proton CT overestimated range by up to 1%. The average range accuracies were +0.1%, -0.1%, and -0.4% for proton CT, helium CT, and carbon CT, respectively. "We can achieve way better accuracy than the 3% in HU conversion," Meyer said. Ion beams have an increased relative biological effectiveness (RBE) compared with photons -- so could the imaging dose from ion beams be problematic? To answer this, Meyer and colleagues used Monte Carlo simulations in combination with the repair-misrepair fixation model to estimate cell survival and double-strand break (DSB) yield for the various ion beams. With respect to diagnostic 130 kVp x-ray radiation, the mean RBE for cell survival was 0.82-0.85, 0.85-0.89, and 0.97-1.03 for proton CT, helium CT, and carbon CT, respectively. RBEDSB (the RBE for DSB induction) was 0.82 for protons, 0.84 for helium ions, and 0.95 for carbon ions. "The RBEDSB relative to x-ray CT spectra is below one," Meyer pointed out. "These preliminary studies on biological dose show a reduced biological implication, but more studies are required." He concluded that helium CT exhibited the lowest overall RSP error, while proton CT and carbon CT had the highest accuracy for soft tissue and bone, respectively. All modalities showed sub-1% range accuracy for treatment planning and good dosimetric accuracy compared with the ground truth.